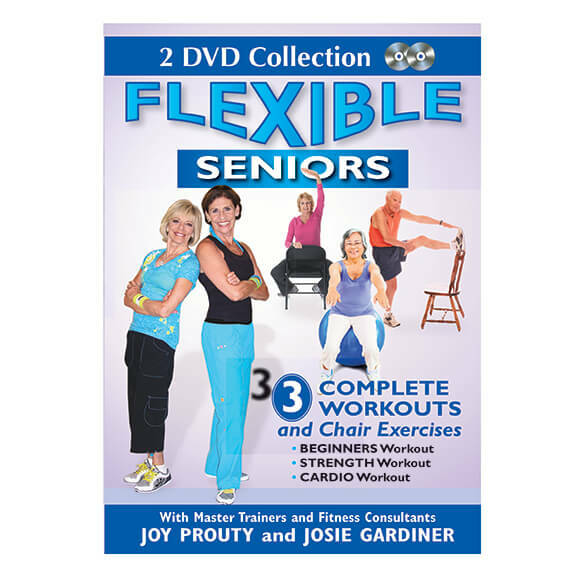 Whether your goal is to regain or maintain flexibility, increase functionality, lose weight, build muscle, strengthen bones or simply feel better, these senior-focused Flexible Seniors 2-Disk DVD Set makes it easy! Created by award-winning trainers and fitness consultants Joy Prouty and Josie Gardiner, the seated or standing exercises will get you moving to safe, effective fitness, all set to the fun, inspiring sounds of Big Band and Swing music. The exercise videos for seniors includes: Total Body Stretch, 30 Minute Stretch, Light Workout and Step Workout. My husband is in a wheelchair, and I am his caregiver. I need to stay flexible.